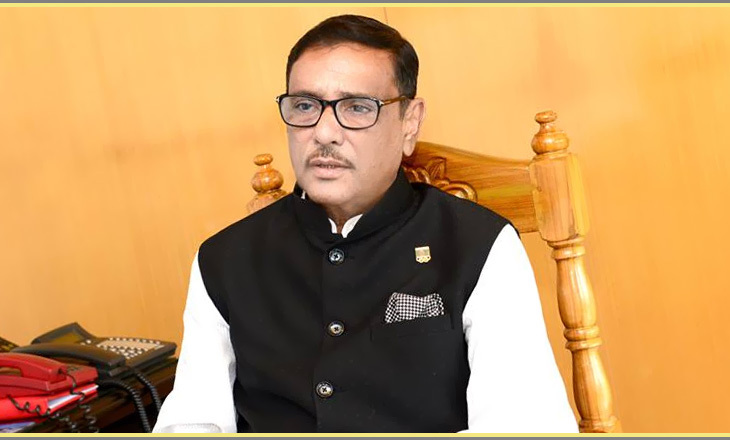 Awami League General Secretary and Road Transport and Bridges Minister Obaidul Quader on Friday said BNP has started hatching conspiracies to create a dangerous situation like 1/11 in the country. “The perpetrators of the 1/11 (of 2007) are helping them (BNP) implement their design,” Quader said told journalists while visiting Mohakhali Bus Terminal here. “The people of the country are happy with Prime Minister Sheikh Hasina for her government’s tremendous development activities in every sector and they will give their verdict again in favour of the present Awami League government …The people will reject those involved with conspiracies,” he said. He said the countrymen will vote again in favour of the pro-liberation forces as BNP and their collaborators are a threat to the Liberation War spirits. About the election-time government, he said there is no scope to keep anyone from BNP in the polls-time government as the party has no representation in the parliament. “They didn’t come when they had the chance…Even the government offered them the home ministry but they failed to receive our offer. Now we have no plan to keep them (BNP) in the small cabinet,” Quader added. He said the election will be held as per constitution and the Election Commission (EC) is the authority to hold the polls. The EC has already declared that they have completed around 90 percent preparation works to hold the election, he added.